After 120 self-immolations over the past four years, a series of events in Tibetan regions has sparked speculation that Beijing is rethinking its hard-line stance towards the ethnic minority. Since Radio Free Asia reported on Wednesday that open worship of the Dalai Lama was no longer prohibited in Tibetan areas, international media have been buzzing with cautious optimism. What is described as an "experimental" policy appears uncharacteristically tolerant. Even interacting with the exiled Tibetan leader has been enough for Beijing to keep overseas politicians out in the cold; British Prime Minister David Cameron just finished a 14-month stint. But now, apparently, previously hidden portraits of the Dalai Lama can be displayed in monasteries again - as long as a clear distinction is made between his political and religious roles. Are things finally starting to look better for Tibetans? Not necessarily. 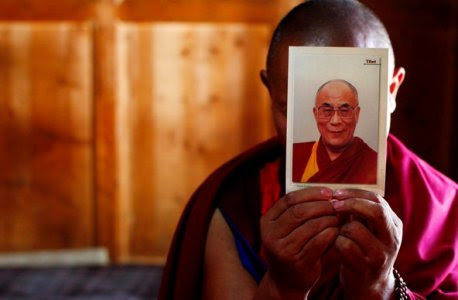 "While the Dalai Lama photos carry symbolic importance to the Western audience, this is not a very significant indicator for anyone in the Tibetan Autonomous Region," said Robert Barnett, director of the Modern Tibetan Studies Programme at Columbia University in New York. "We should be optimistic, but this will not necessarily add up to what people would like it to." In fact, the ban was never strictly enforced in Qinghai and Sichuan , where it may now in part be lifted, Barnett said. And besides, the policies from the more lenient Tibetan areas very rarely spill over to the Tibetan Autonomous Region. Also, the eased policy may affect only a limited area. The Tibetan government-in-exile in Dharamsala, India, said on Thursday that the reform had only been reported from the areas with the highest rates of self-immolation. The most recent fatal protest was only three weeks ago, when 31-year-old Wangchen Dolma set herself on fire near Tawu monastery in eastern Tibet. Other developments threaten to dim the prospects of a brighter future for Tibet. A report published by Human Rights Watch said two million Tibetans have been forcibly relocated to "new socialist villages" since 2006. The moves require Tibetans to sell yaks, farmland and other means of traditional livelihood and survive on government handouts. Last week, a petition urging Unesco's World Heritage Committee to protect Lhasa's old city from Beijing's "modernisation" drive collected its 100,000th signature. Meanwhile, two Tibetan folk singers were jailed for allegedly supporting "separatism" in a music video. Nicholas Bequelin, a senior researcher at Human Rights Watch, said any reforms merely reflected a revision of Beijing's counterproductive security policies. "What matters to Beijing is how to cement its control," Bequelin said. "If the religious policies don't help Beijing's objective to domesticate the region - avoiding popular protest and ethnic tensions - then the leadership will revise them. "This just reflects that the new leadership is more pragmatic about these issues, but the fundamental policy has not changed. Ironically, the new policies also reflect confidence from the government that it has increased control of the monasteries." Human Rights Watch reported in March that a new surveillance "grid" with more than 600 new police posts had been set up throughout Tibet, and that party cadres had been stationed in all monasteries. Still, there are other indications that things may be stirring in Beijing. Perhaps more significant than the treatment of the Dalai Lama's portrait were two high-profile visits to Tibet last week. Travelling to the region requires a special permit and remains extremely restricted for foreigners, especially diplomats and the press. Last month Beijing lashed out at a French documentary filmmaker who went to Tibet undercover as a tourist to gather footage. Nonetheless, US ambassador Gary Locke was allowed to visit areas in and around Lhasa to "increase familiarity with the local conditions". It was the first American diplomatic visit since 2010 and only the third in the past decade and attracted much press coverage. Few, however, noted the arrival of Rigzin Wangmo, a daughter of the 10th Panchen Lama. Rigzin Wangmo has been blocked by Beijing from visiting Tibet for many years and was greeted by thousands of Tibetans in Lhasa, despite government attempts to keep the visit secret. "This could be read as a signal that leaders are starting to pay attention to cultural affairs of the Tibetans," Barnett said. "These visits suggest to Tibetans that hardliners of the Hu Jintao era are no longer running the show. These are early signs that debate regarding Tibet is allowed." Still, while many outside China would welcome a softer approach to Tibet, there may still be little incentive for the leadership to improve the situation. "Changing ethnic policies is very risky and a direct personal liability," Bequelin explains. "If it fails, the consequences for whoever is in office are profound. And if it succeeds, well that's good, but who cares? The government has bigger fish to fry right now."